AC solar module with 101 watt 120 VAC 60Hz output for grid tied connection only. Polycrystalline silicon cells, tempered glass front, heavy aluminum frame, Trace microsine inverter. Inverter was also sold as a model OK4U outside the USA. AC Photovoltaic Modules are the ideal approach to building an incremental PV utility intertie system. The advantages of this modular approach for a utility interconnect are the low minimum system size, the ease of system expansion, and the cost savings in installation and design. The effect of shading or mis-orientation of individual modules on overall array power output performance is minimized because each module operates independently. The modular inverters automatically sense the presence of the utility grid and are able supply power to it with very little sunlight because of their maximum power point tracking ability. Utility required islanding protection is automatic. Using AC modules reduces system design to a simple matter of choosing how many AC modules to utilize. It is no longer necessary to configure a PV array to match the voltage, current and power requirements of a conventional central power conditioner. By maximum power tracking each module independently, mismatch losses between modules of an array are eliminated. Expensive and hard to find DC-rated switches, fuses, and power-robbing blocking diodes are eliminated. This module is designed to produce 101 Watts of utility grade AC power at 120 Volts and 60 Hz. The heart of this module is the Trace Microsine integrated inverter. 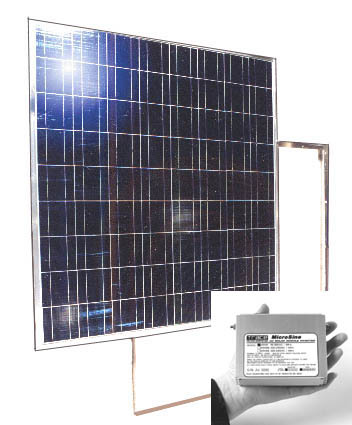 This is a palm-sized, 100 Watt, inverter designed to be mounted on the back of a PV module. We mount the Microsine of the back of a PV module. These modules can be wired in parallel using standard AC installation methods and components. The system is completely modular; simply add another module when you are ready to expand. This item normally ships 5-10 business days after order acceptance. Ground shipping and handling charges to the continental US for this item when ordered alone are approximately $33.